Lexus has launched the third generation of its IS sedan range and has gone way out in styling. The smallest Lexus sedan was designed from the first generation in 1998 to have sporty, balanced dynamics, but until this latest model has been somewhat hesitant in its styling. It was as though the designers were torn between sensible and sedate – like the larger Lexus models – and having a real go at sports-sedan style. 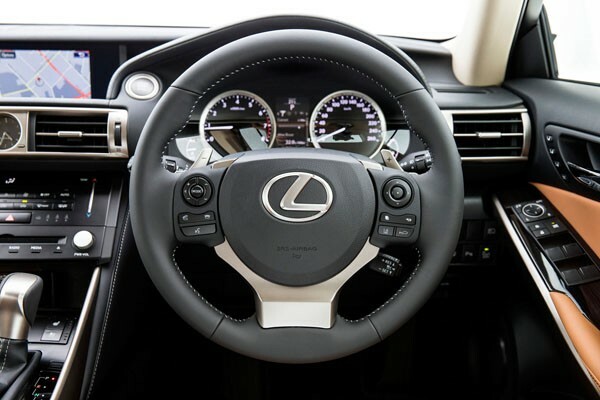 It comes as no surprise that the new Lexus IS models have grown in size and are longer and wider to provide more interior space especially in rear-seat legroom and boot capacity. As well as added oomph in the styling department, all models provide the option of the F Sport package with an adaptive suspension system, including a new drive-mode select. The new Lexus IS range is right out there in its looks, arguably having a more aggressive appearance than the big name Germans it’s tackling. Audi, BMW and Mercedes small-medium sedans are relatively conservative when you view them alongside this new Lexus. The extra large ‘Lexus spindle’ radiator grille certainly dominates the appearance of the new Lexus IS 250 Sport we have been driving for the past week, and is further enhanced by the bold shape of the of the cutouts for the cooling and lights. The sweeping profile works nicely and flows beautifully upwards as it approaches the tail of the car. The Lexus F Sport (the ‘F’ stands for Mount Fuji and denotes the company’s high-performance division) has even bolder front and rear bumpers, as well as side skirts, bolder finishing in the grille and sportier looking wheels. These high quality Japanese cars are immaculately finished inside and out in a tradition that has been with the Lexus marque since day one. The quality of materials and workmanship not only makes the car a delight to look at and sit in, but also makes for provide durability and reliability. 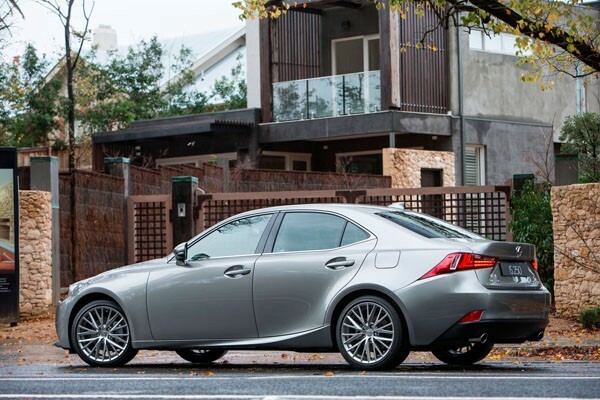 The engine in the Lexus IS 250 is unchanged from the outgoing model. The 2.5-litre all-alloy V6 develops 153 kW of power and 252 Nm of torque. Transmission is through six-speed automatic transmission with sequential changes should the driver disagree with the ratio the computer has chosen. Also on offer are a 3.5-litre V6 with 233 kW and 378 Nm, which is an updated version of the previous unit. It’s mated to a new eight-speed automatic transmission. It doesn’t make sense for the lower powered engine to have fewer gears than the higher powered model – but these days the marketing people frequently take priority over the engineers in matters like this. 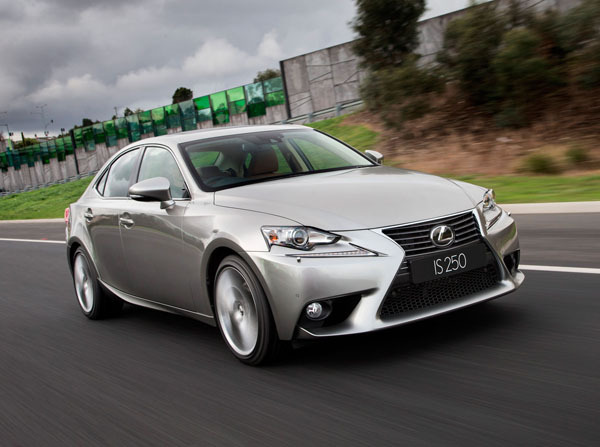 The Lexus IS range now includes a hybrid for the first time in the form of the Lexus IS 300h. It combines a 2.5-litre four-cylinder petrol engine with an electric motor to provide a combined power output of up to 164 kW. The hybrid uses an efficient CVT automatic transmission, with preset ratios operated by paddle shifters. Standard features across the new Lexus IS range include eight airbags, powered and ventilated front seats, reversing camera, satellite navigation, a new pedestrian protection pop-up bonnet, drive mode select, tyre pressure warning sensors, keyless entry, dual-zone climate control, Bluetooth phone and audio and digital radio. Sports Luxury models also get extra airbags, a Pre-Collision Safety System (PCS), adaptive cruise control, blind spot monitoring and lane departure warning. The driver’s seat proved well shaped to our tastes and provided the sort of support you would expect from a sporty (rather than full-on) sports sedan. Engine performance, even from the smallest of the powerplants on offer, the 2.5-litre, is excellent. It’s silky smooth, nicely responsive and happy to rev towards the top end of the tacho. Great handling balance is provided by a chassis that has a front engine set well back and driving the rear wheels. Lexus made no secret at the start that it was chasing BMW in this important field and those who enjoy driving will appreciate the way the IS 250 feels even better the harder you drive it. It’s more than happy to change direction part way through corners and anyone who doesn’t come back with a smile on their face after a fang over their favourite road hasn’t been trying hard enough. The adaptable suspension lets you chose the amount of comfort you want and was really appreciated when we encountered harsh surfaces. An even further push by the Lexus IS into the sporting field is backed up by a bold body and fine handling. This is the sort of machine that should be tried by those wanting to get away from the predicability of someone otherwise locked into the big German trio. Note: Prices do not include government or dealer charges. Contact your local Lexus dealer for driveaway pricing.